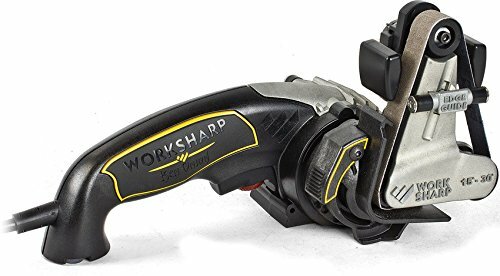 The Work Sharp Ken Onion Edition Knife & Tool Sharpener is designed to sharpen every knife you own, quickly and easily. The Ken Onion Edition Knife & Tool Sharpener uses a fully adjustable precision sharpening guide (15° to 30°), heavy-duty variable speed motor, and premium ¾ x 12 inches flexible abrasive belts to sharpen pocket knives, hunting knives, kitchen knives, fishing knives and virtually any other shape or type of blade – even scissors and yard tools. It’s fast, easy, and delivers consistent results every time. PROUD TO BE AN AMERICAN COMPANY - This tool was engineered and assembled by hard working Americans. Work Sharp is part of Darex, a 4th-generation family owned company in Ashland, Oregon. For over 40 years we have been creating industry-leading sharpening tools here in the USA. If you have any questions about this product by Work Sharp, contact us by completing and submitting the form below. If you are looking for a specif part number, please include it with your message.